The world and the legal profession – especially smaller and midsize law firms – are changing radically and rapidly. To adapt to these changes and respond to challenges and compete as viable entities, the future requires thoughtful, proactive planning and bold leadership. That’s why managing partners need to re-envision the law firm. “MPF Insight,” an in-depth report developed by Jaffe, The Remsen Group and the Managing Partner Forum, will help you do just that. 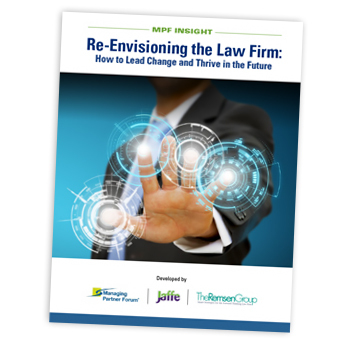 It also shows how smaller and midsize firms are currently operating in the face of unprecedented change, and provides detailed recommendations for leaders to successfully bring their law firms into the future. The law firm must be run like a business (not more like a business, but like a business). The managing partner must take ownership of leading the effort. Firm owners must take responsibility for embracing, engaging with and implementing the necessary changes for operating like a business. Our recommendations will not be easy to implement. In fact, many of them will be quite difficult because they require bold, decisive action. But implementing them will help you and your law firm move into the future and compete effectively in a continually changing landscape and world.